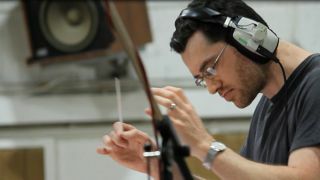 Austin Wintory is perhaps most well known for his work on thatgamecompany's Journey, but he's also worked on PC games like The Banner Saga, Monaco, and Sunset. Now, Ubisoft has announced that he's adding Assassin's Creed Syndicate to the list. Apparently Wintory has been playing the series for a long time. As for his approach to the music, he shied away from looking to actual music from the period in which the game is set and instead took his inspiration from the characters of Evie and Jacob, whom he describes as having "wonderful confidence, almost arrogance", as well as "the fascinating, contradictory world of Victorian London". This video has no commentary, no developers speaking over the top. Just listen to the music, and maybe watch how they've paired it with footage from the game. Expect soft piano for emotional beats and strings for drama. I also think the use of wind instruments like flutes fits well in a game set on rooftops that always makes reference to birds of some kind. There's no denying Wintory has skill. Let's hope he doesn't get in trouble this time.